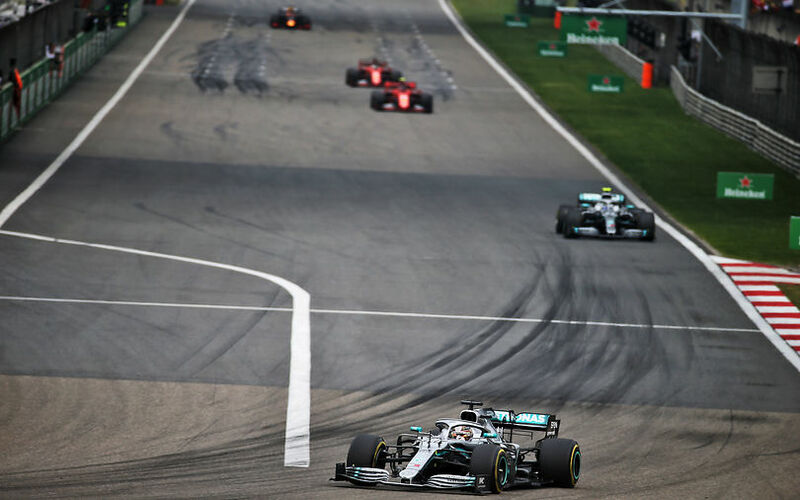 The start was a reasonable straight forward affair at the front, even though Hamilton got the lead over Bottas, and Vettel managed to sneak ahead of Vettel by the end of the first lap. The trouble happened further back, where Norris was very unlucky to get kicked by Kvyat. Sainz in the other McLaren picked up some debris, and it was eventually Kvyat who was penalised for causing the collision. The Russian retired later on in the race as well. It didn't prevent the fact that both McLarens were then facing an uphill battle, with the two of them in the final two positions just a few laps into the race. As both Mercedes ran away with it, Leclerc was asked on lap 11 to let Vettel past. The German didn't make the best use of that advantage, as he was unable to gain any considerable advantage over his team mate. Then Verstappen pitted on lap 18 to change to hard tyres. Given the proximity, the move put Ferrari under pressure. The team at that time probably hadn't many options and opted to pit Vettel to cover that move, leaving Leclerc in the cold. The Dutch Red Bull driver attempted a pass at the back straight half a lap later, got past through the corner, but re-passed while accelerating out of the corner. That lap however was the fastest race lap so far. Meanwhile, Leclerc was told to go as long as possible on the first set of tyres, knowing at the time it was useless to pit, as a pit at that time would almost certainly put the Ferrari driver behind Verstappen as well. Mercedes pitted their cars the next few laps. First Bottas, then Hamilton. This saw the getting closer together, but as Hamilton had a comfortable 5s in hand, he still had 3 to lead the race. Leclerc was pitted in the same lap as Hamilton, and as predicted, ended up 10 seconds behind Verstappen. Leclerc went on to reduce the gap to Verstappen, to a point where Leclerc actually asked if he wouldn't have to start taking care of the tyres. A short "we need to push" message from engineer was clear enough. Leclerc reduced the deficit to 3 seconds until Verstappen was pitted to change for softs on lap 35. Ferrari obviously reacted to pit Vettel the next lap. Hamilton was soon pitted, followed by Bottas in the same lap. Two very speedy pitstops by the Mercedes crew were a wonderful display of the team's professionalism. Bottas emerged in the mirrors of Leclerc three laps later, and made pass stick one lap later after losing some time behind the Ferrari. That allowed Vettel to come a bit closer, but certainly not enough to threaten the Mercedes. Leclerc went on with the same tyres until Vettel got past him, even though Verstappen at the time was also gaining nearly 2s a lap on him. When the Ferrari was eventually pittted, there were 14 laps left for him to get back to Verstappen. With more than 14s behind, that soon seemed like a hill too steep to climb. In 6th, Gasly meanwhile had an anonymous race, just like Ricciardo in 7th. The remaining Renault, following a technical retirement from Hulkenberg at comfortable in that position but saw Perez and Raikkonen come close around 10 laps from the end. Towards the end of the race, as positions seemed more or less fixed, Gasly was pitted to change to soft tyres, attempting to get a championship point by doing fastest lap. It worked out perfectly for him, snooping away the fastest lap from Vettel in the penultimate lap. In the end, Mercedes secured their third consecutive 1-2 finish, making for a comfortable margin in the championship.